Uluru (aka Ayer’s Rock) is probably the single most recognizable feature in Australia. While it is probably one of the bigger tourist attractions in the country, getting there is a challenge. The closest city is Alice Springs which is a three hour drive. While you can fly to Uluru directly, it is an expensive flight and most people go from Alice Springs, which is where my adventure started. I don’t know why, but the economics of tours to Uluru is such that a three day trip is cheaper than a two or one day trip, so that is what I took. The tour was 20 people, mostly early 20-somethings from the UK and Ireland and two retired couples from the Switzerland and Australia. We got picked up at 6 in the morning in a small bus that exactly fit 20 people. It also had a trailer which all our gear and the camping supplies were hauled around in. When I say “bus” it was closer to a school bus than a touring coach. It was extremely uncomfortable and difficult to sleep in, which is a big deal when you have to drive for several hours a day. After making sure everyone was paid, we arrived at Uluru/Kata Tjuta National Park. 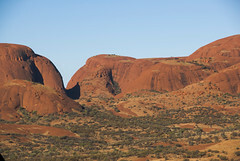 Most everyone has seen photos of Uluru, but you almost never hear about Kata Tjuta (the first “T” in Tjuta is silent). Kata Tjuta is a monolith similar to Uluru, except broken up and slightly higher. You can easily see one from the other as they are only about 10km (6mi) apart. In many respects, Kata Tjuta is just as impressive as Uluru. Because the rocks are broken up, you can walk around inside, between the rocks as opposed to just around it. While we were walking around Kata Tjuta, we ran into a bunch of different European church groups who were in Australia to see the Pope. None of the hiking in Kata Tjuta was very difficult. There was some vertical climb, but it wasn’t anything difficult. After walking around Kata Tjuta for a few hours we got back into the bus and drove back to Uluru for sunset. 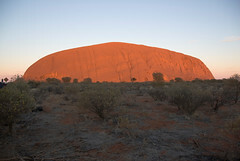 The rock in Uluru is heavy in iron, which is why it is red in color. It also changes the shade of red through out the day as the sun climbs the sky. Every photo of Uluru you see is pretty much one of two angles. There are sunset and sunrise viewing areas so you can see the rock in the best light. 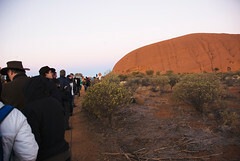 Because the sunset and sunrise color of Uluru look the best, you only see photos from those two angles. The sunset viewing area was packed. I think that many of the Europeans who were in Sydney to see the Pope visited Uluru on the way home. We had champagne (well, sparkling wine to be precise) as did many of the other groups. 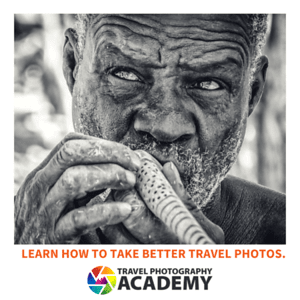 I’ve noticed this with many tours I’ve read about on my trip. Somehow, adding champagne and cheese to something makes it classy. I barely slept that night because it got so cold. The temperature dropped to about 28F (-2C) and the sleeping bag really wasn’t up to that sort of temperature. The next morning we got up at 5:30am to pack and get to Uluru by sunrise. Sunrise was just as crowded as sunset, except it was much colder. We then had the next several hours to walk around Uluru. 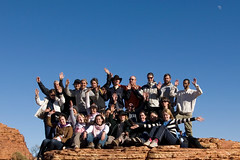 Several guys did the hike up to the top of Uluru. There are all sorts of advisements about how the local aboriginals don’t want you to climb to the top, yet they have hand rails on the path and don’t actually ban anyone from making the climb. I kept looking for a reason why they didn’t want you to climb, but I could never find any straight explanation. At no point did I ever read anything which said that you shouldn’t climb to the top because it isn’t respectful of their traditions. They sort of imply it, but never come out and say it. They will say that is a tradition, and they will say you shouldn’t climb for reasons of safety, but they never say you shouldn’t climb because of their traditions. The local abrigional people own the land which Uluru sits and are heavily represented on the board which runs the park, so they could ban people from climbing if they wanted to, but they don’t. 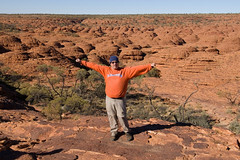 After walking around Uluru, we got back in the bus and drove for several hours to King’s Canyon. The routine that night was the same as at Uluru, except that it wasn’t nearly as cold. When we got back to Alice Springs, I was tired from three days of walking, dirty from all the dust and sweat, and had a terrible runny nose from being cold. Uluru is one of those thing that you really should do if you visit Australia, but you have to work to get there. It is well worth the effort. I remember you went to Uluru right in the middle of the coldest period we had in Brisbane all winter. There was a massive cold front that came up from the bight, and it got cold enough to snow just inland from us here. I’ve got to say that your timing seems to be excellent. I didn’t get to see Uluru at sunset because it was raining when I was there. We were disappointed, but our tour guide was really good about getting us excited about seeing such a rare occurrence. She said that the only time you see locals at the rock is when it is raining. And, the sunrise made up for any lingering disappointment. It is a truly impressive sight. It is one of the most magical places in the world, especially in Australia.